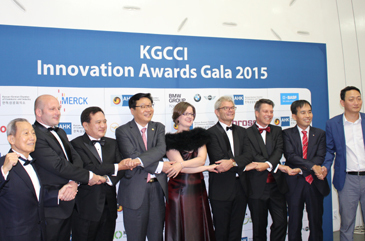 At the first "KGCCI Innovation Awards," recently held at Sebitseom-Island in Seoul on Sept. 9, 2015, the most innovative Korean and German operations in Korea were recognized with the new KGCCI Innovation Awards. Among the distinguished guests were Vice Minister of Strategy and Finance, Joo Hyeong-Hwan, German Ambassador Rolf Mafael and EU-Ambassador Prof. Gerhard Sabathil and about 170 German and Korean business leaders. Vice Minister Joo Hyeong-Hwan emphasized in his congratulatory remarks the special bond Germany and Korea share together in their common history of overcoming economic crisis and of course, the segregation of their countries. The award for “Innovation in Business” went to BMW Group Korea for their Driving Center. The BMW Driving Center is the world first “for customer” facility that contains not only a Driving Track, but also a Brand Experience Center, a Junior Campus, a Training Academy, a R&D Center, a Service Center, a Restaurant and a Sports Park. It has changed a paradigm: from Manufacturer-Oriented Market to Customer-Oriented Market (Experience Marketing) and it is successful: more than 100,000 visitors, and double digit increase of New Car Sales are speaking for themselves. Category Innovation in Green Technologies: va-Q-tec Korea Ltd. The award for “Innovation for Green Technologies” went to va-Q-tec Korea for their “Vacuum Insulation Panel” or short “VIP”, va-Q-tec is setting new standards for reducing energy consumption with its vacuum insulation panel, which is 10 times more efficient than conventional materials. va-Q-tec brilliant innovation enables simple design and passive systems, so that no-system failure-products are realized. va-Q-tec is a small company with 200 employees founded in 2000, but is taking the responsibility for the next generation and environment by Energy saving and reduced CO2 emission. Category Innovation in Workforce Development: BASF Company Ltd. The award for “Innovation in Workforce development” went to BASF Korea for their Diversity and Inclusion initiative. Traditionally, many companies in Korea have a strong hierarchy and a culture that is not very inclusive – for example for women, foreigners, young people and newcomers in the company etc. BASF Korea established a Diversity and Inclusion (D+I) committee with 15 members from different units and backgrounds in 2007. In 2015 they added "Wild Card"(a so called junior board) & ‘Trusted working time’ (2015). BASF is playing a pioneering role: female employees are contributing 14.6 % of the workforce at BASF, which is twice the average of the Korean chemical industry and is regarded as one of the 30 most attractive foreign employers. Trusted working time and inclusive culture of BASF Korea driven by its D+I activities could work as role model in Korean society and businesses towards a more work-life balanced culture and help to master the Demographic Challenge.